(December 2012 update: a set of replacement Y-Main and two brand new, OEM buffers is now available at our store for an exchange service. Still, please read the article before proceeding there! I've been planning to post this for a long time, but various things have been stopping me until today. We at Coppell TV Repair often receive questions about those. Do we repair buffer boards? How much would it cost to have all 3 replaced? Are the new buffers better? Should the customer invest in repair or junk the whole TV? Some of those questions do not have simple straightforward answers. I really wish it was that easy. But it isn't, not unless you want to take the king's approach to it and replace everything. Which, as reality shows, tends to be rather expensive exercise. I truly believe that one of the humanity's major flaws is that it often tries to fix something without understanding what actually had been broken in the first place. Stepping more on the gas instead of releasing the hand brake , treating kids for ADD instead of spending more time with them or taking pills for depression instead of stopping to listen and watch to the media reporting rapes, kills, recession and end of the world in general....just a few from the top of my head. I want to tell you what happens and how it happens. Don't forget, it is all according to me and although I have a graduate in electronics I am much better in software than hardware. Some of my guesses may be wrong...if you catch one I'd appreciate bringing it to my attention. There are two possible problems here: when a buffer fails without shorting and when a buffer fails completely. When a buffer fails without shorting it typically results in horizontal pink/purple lines. They can appear at isolated portions of the screen or on the whole screen. This problem can NOT be detected with a meter or at least I do not know how, but as I said above if you see those lines you your buffers need to be replaced. What if only the upper/lower half of the screen has those? Well, read on as to why it happens and you'll understand. The SECOND, ultimate and actually more popular buffer failure is shortage. While the pink lines described above is only a partial failure which damages the control logic in the buffer ICs, but still doesn't completely kill them this one does. A full failure is caused by a more massive meltdown in the IC during shortage and usually results in a an electrical shortage between the power lines of the buffer. 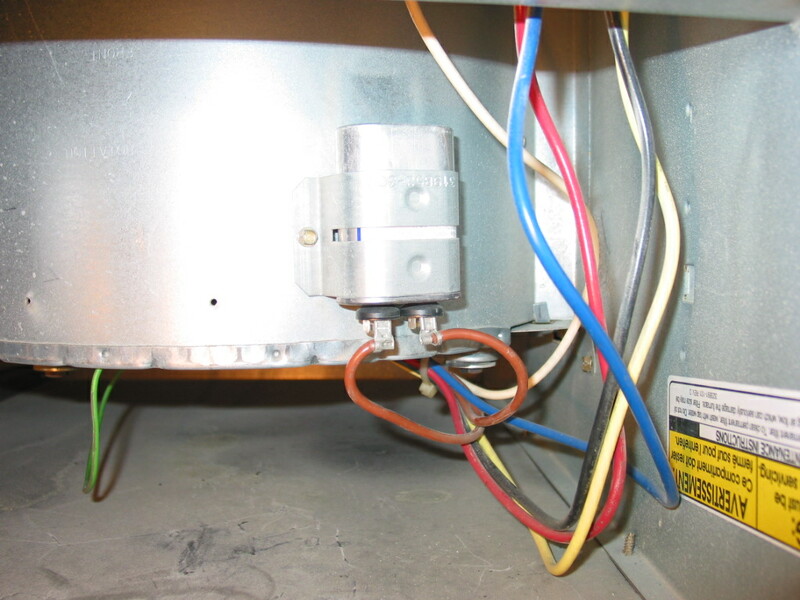 A burned buffer usually takes the sustain down and since both buffers are on the same power track without separation one failed buffer usually damages the other one as well. But why does it all happen in the first place? I have two theories on what exactly is wearing out more: one is the semiconductor junctions inside the buffer board ICs are wearing out because of the temperature differences between state at rest and state at work: when they work they get hot, the matter expands and changes structure, even by a tiny little bit, then when it cools off it shrinks and the little change remains. Over time, a micro-space develops as a defect in the semiconductor junction which one day leads to a shortage. The other theory is that the insulation material they use for covering the IC pins changes properties over time, allowing for a high-voltage spark to jump from one pin to another, i.e. from a high-voltage output to a low-voltage power supply or control pin. Over time I started leaning more towards the first theory as the same thing tends to happen in other components that do not have silicon insulation over their pins. So the IC burns, melts and shorts. That causes a momentarily overload to the Y sustain board which also burns one or more output components. Finally, since the two buffers share common data and power line without separation any high-voltage jumping to the shared low-voltage power or data tracks tends to damage whatever it finds there that is not designed to handle it. Imagine placing 120V on a 5V data line....what do you expect?! Which means that whenever a buffer shorts, usually all three boards end up being damaged! The second buffer is not always shorted. Sometimes - in fact most of the times - it looks like normal, but will burn upon its first run in real condition. Conclusion 1? When a failure is caused by a burned buffer LJ92-01202A or LJ92-01203A it is best to replace BOTH buffers. If our explanation is right and the silicone insulation on the buffers wears out due to the high temperature....until one of the buffers doesn't hold any more....how much longer do you think the other buffer will be able to carry on? Think of it this way: if say the front two tires on your car wear out to a point where one of them tears out while driving...will you replace only that tire? And why? Knowing that the failure of one buffer carries high risks of taking down the other...and knowing the buffer prices (which are anything but low) it's a no-brainer! REINFORCED CONCLUSION 1: When a failure is caused by a burned LJ92-01202A or LJ92-01203A buffer it is BEST to replace BOTH buffers. Note: Sometimes the buffer defects in a way that does not immediately result in a complete short, but rather in a visual defect represented by pink / red sparkles in horizontal lines on the screen that vary from 1/6 of the display to the full display. When it is on the full display this can also be confused with another popular problem which has nothing to do with the buffers, but rather the Y sustain board. Note 2: Buffer boards can be repaired sometimes, however most of the time it doesn't make practical sense for the very same reason for which it is best to replace both buffers when one dies: all ICs on the buffer board have been wearing out together and replacing one or two of them at a time, while fixing the problem temporarily, does nothing to prevent the soon-expected failure from another IC. And replacing all 6 usually costs more than buying a new buffer. The same truth that holds for the buffers also holds for the sustain board LJ92-01200A (and in fact for all electronics) - heat wears them out. As we said earlier when a buffer shorts it usually takes down the sustain along with it. Once damaged, the sustain may be damaged in a way such that, if you install new buffers, it will kill them on the first run. When we say may we mean it happens. Not too often but still often enough. CONCLUSION 2: WHEN A BUFFER FAILS IT IS IMPERATIVE TO CHECK AND, IF NECESSARY, REPAIR Y SUSTAIN MAIN LJ92-01200A. Note: This is the only Y sustain failure that I know of as of the time of this writing that presents a danger to the buffer boards! I hope I will be forgiven for not telling you how exactly to repair this failure. I'll only say there are several common scenarios and information for some if not all of them is likely available around the Net. As I've mentioned before we know there are other technicians who monitor this blog and start competing with our services on Internet based on what they learn...you get the point. Pay attention, though, that the sustain does not fail 100% of the times when a buffer fails. In the tens if not hundreds of boards that we've serviced I can recall two cases where we had both buffers burn, but the sustain still working. IS THE MAIN IC BURNED ON THE Y SUSTAIN MAIN LJ92-01200A? While it is bound to happen sooner or later for the same reason for which most of the plasma sustain boards designed and produced at this point in time. People - both home DIY self-repairmen and professional technicians - often think the IC has failed when in fact it has not (it's only been a buffer failure, hehe!). Fact: when main IC on Y SUSTAIN MAIN LJ92-01200A fails, it usually results in a blown fuse F5004. This is the largest fuse on board located right next to the IC and above the power connector. When it comes to problems this is one of the most versatile boards I've seen. * Nearly all electrolytic capacitors bar the largest two can be seen swallowed and/or defected. Chances are I am missing some. It's getting very late here and I think I'll stop now. I may write a follow-up or edit this article to present general conclusions. But, in short, it helps to understand why we are asking for all three boards to move together, why most of the time we advise people to replace both buffer boards and why in the rare cases when at least one of them is working we spend a lot of time trying to educate them about the risks they're taking with replacing just one of the buffers. And, if you're service technician, hope you link to this article! 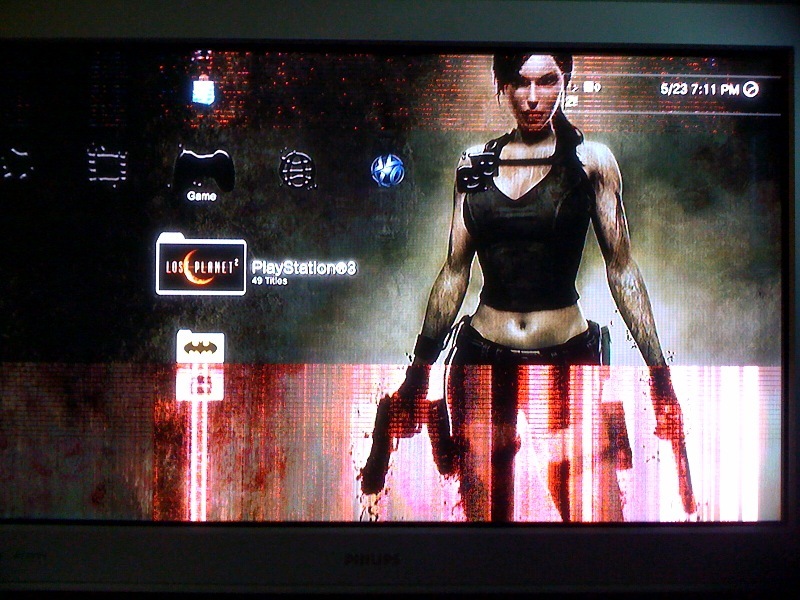 This article describes a common problem and fix to all DELL W4201C HD plasma TVs. We've done enough such fixes to realize this is a serial defect that is going to be present in most if not all of these TVs. 5 May 2011 update: The same symptoms and solution apply to DELL W3201C, DELL W5001C and DELL W4201C! You will benefit from doing it even if the actual problem with the TV turns out to be different (which is always possible). If you can't do this on your own you can send the power board to Coppell TV Repair and we will do it for you for a very reasonable fee. Anyway, let us start with saying that the DELL W4201C is a Samsung plasma TV sold under the DELL brand. It features the infamous trio of 1) Y sustain board LJ92-01200A / LJ41-02759A and the related two buffer boards 2) LJ41-02760A / LJ92-01202 and 3) LJ41-02761A / LJ92-01203. This trio on its own is a source of a bunch of problems that I had touched on in previous posts and will soon summarize and expand in a new larger post. All TVs (and there are quite a few of them) using the same trio exhibit the same symptoms, regardless of their brand. Again, that is discussed separately. 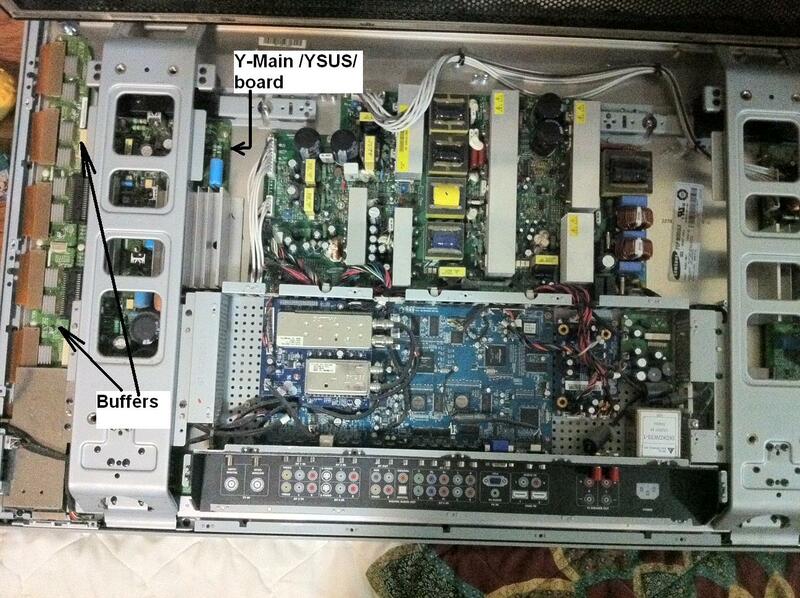 This post focuses on a specific problem commonly observed in DELL W4210C HD plasma TV and other TVs that use the same power board, specifically the PSPF651B01A / LJ44-00110A. Symptom: Upon powering on the TV you can hear the power board starting to work, but screen never comes up. TV may stay on or turn itself off after a short while. Note: This symptom is very similar to the one exhibited by a dead buffer/sustain board depending on how did they burn (which can't be predicted). It is very important for you to understand that what's described here may be not what you're looking for. 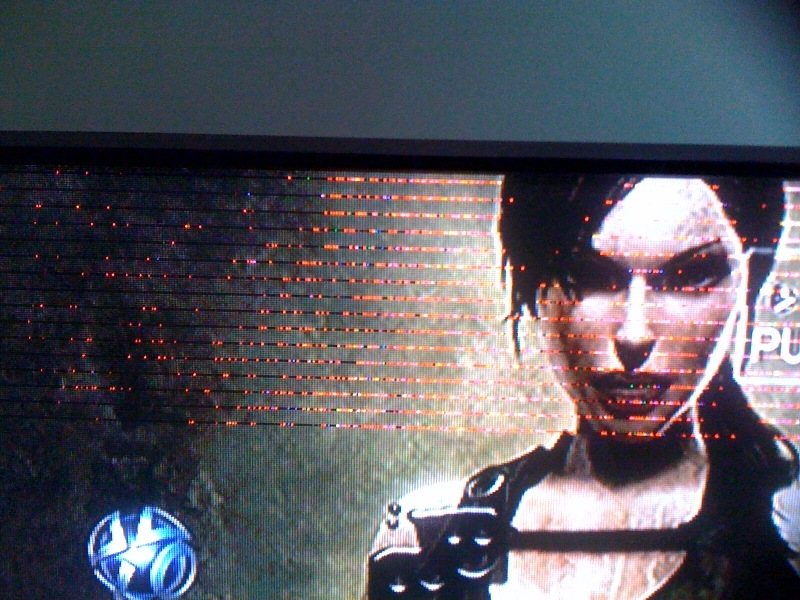 But it's sure very common and if it hasn't happened to your TV it will sure happen! 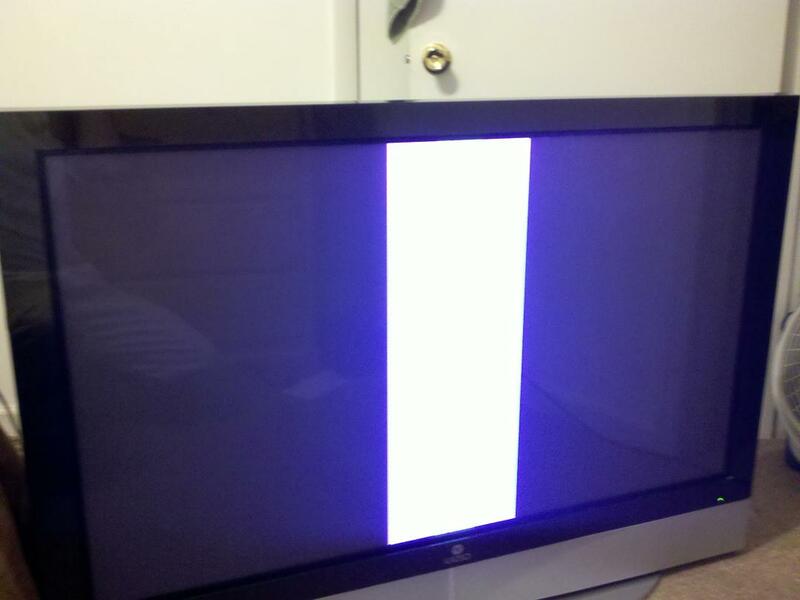 If your TV has been showing pink/red horizontal lines prior to dying, on parts of the screen or on the whole screen, then this post is likely not for you (even though you may still benefit from reading it). 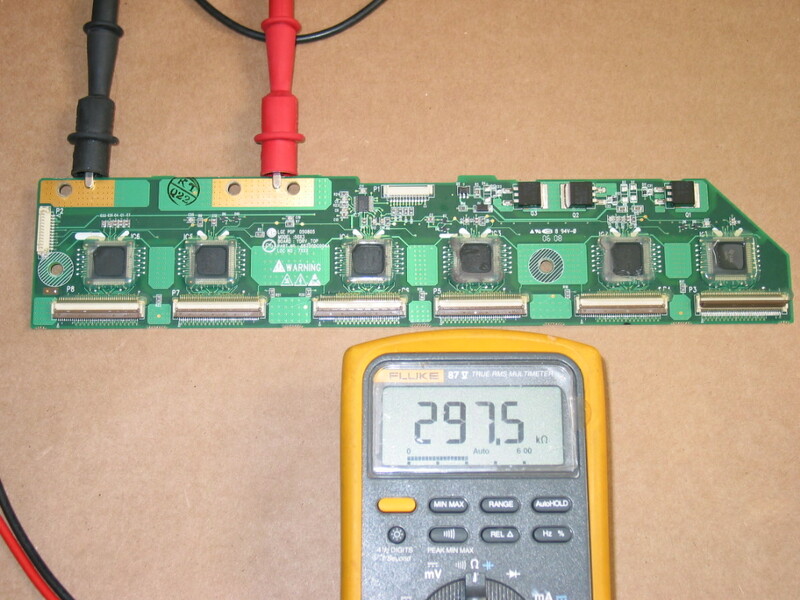 Solution: The power board of the W3201C HD has 2 electrolytic caps that are under-rated and tend to cause problems with the basic power supply needed by the main board. When they dry too much the main board just fails to operate normally and the TV, upon initial power-on hangs in an undefined state where pretty much the only thing you can do is power it back off. Sometimes it powers off by itself after you wait enough. To get to there you need to lay the TV down on the ground, remove its pedestal / stand and then unscrew all the bolts that hold the back cover to the main chassis. There are two types of such bolts and there are a lot of them. Other than their quantity, though, it shouldn't be hard to do it. 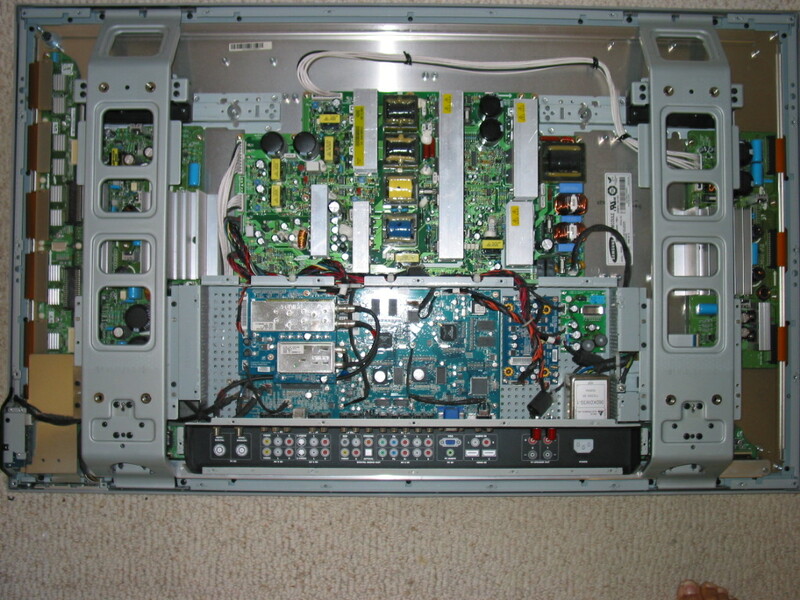 The power board is the large green board with many heat sinks and transformers in the upper half of the TV. You can unplug all connectors (no need to remember which is goes where - can't confuse them) likely except the one in the middle bottom part. To unplug that one you'll need to carefully unscrew all the bolts holding the board in place and pull the board upwards a bit. I strongly recommend using a magnetic screwdriver so that you don't end up chasing screws around the TV body. This is dangerous and may hurt. 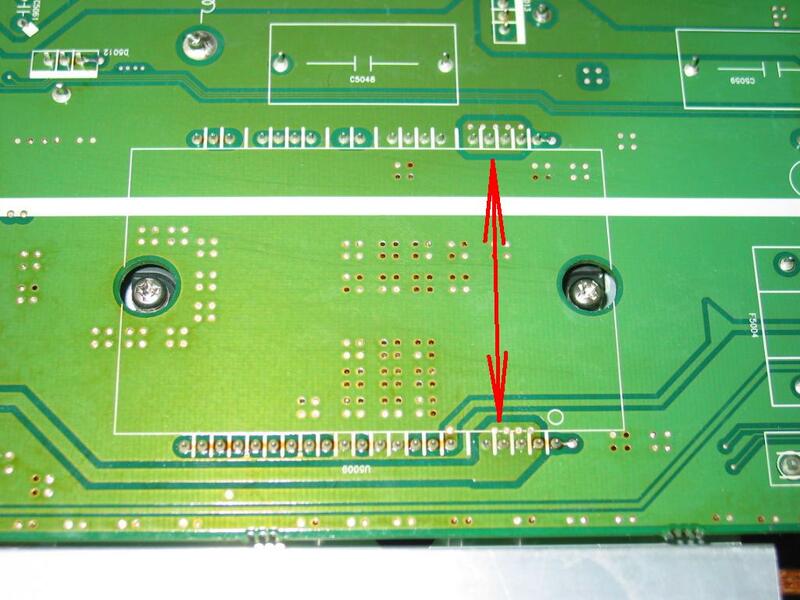 What you're looking for is a pair (or more) of capacitors in the highlighted area that have swollen / bulged tops. 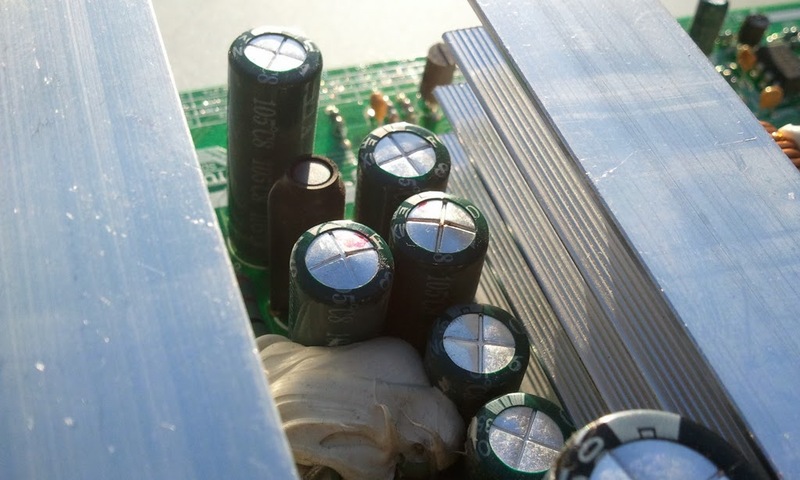 The swollen / bulged capacitors are a common visual, but not ultimate indication of bad caps. 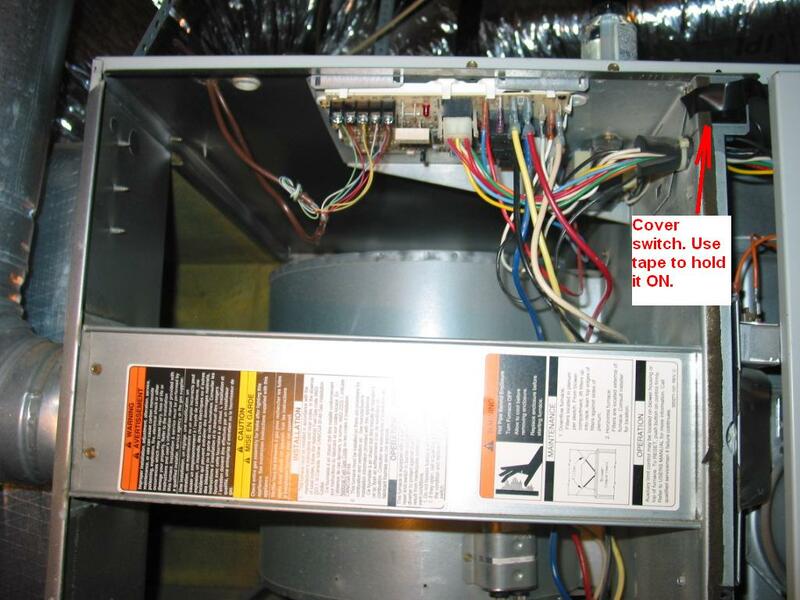 If yours aren't bulged they may still be bad and even if they're not we still recommend replacing them because it is only a matter of time before they turn bad unless they have already been replaced with others with higher voltage rating. We will not put the information for the caps needed here because we know there are technicians monitoring this blog and copying the ideas and know-how from it. Besides, if you get to there you'll know what you're looking for. 1) You can identify and find the replacement capacitors needed by yourself. Make sure you get caps that have same capacity as the original, same or (preferably) higher voltage than the original and same or higher maximal operating temperature (105 degrees should be good). Be advised that space is tight there and it'll be difficult (and more expensive!) to fit in caps with higher voltage rating simply because they will not fit in place. 2) You can save some time and thank us for writing up this blog by purchasing the capacitors from Coppell TV Repair. They'll be shipped within 1 business day via USPS first class mail. 3) If you think you can't do the replacement yourself you can send us the whole power board and we'll do the replacement for you for a very reasonable flat rate. Contact us for details, the first of which is make sure to package the board very well! It is hard to please everyone. Wait, I take that back. It is impossible to please everyone. Customers who send in boards for repair frequently email us after purchase asking that we send them already serviced boards back before their arrive. Some of them want it because they want to watch the Sunday game others want it because they have customers on their own who want to watch the Sunday game. But there's also a third kind : those who want to get rid of their trashed board and want to get a replacement before we see that it's been trashed. This week alone I had to deal with two of these. It takes a lot of time, it is annoying and it inevitably results in recording a loss - financial and emotional. I am not making this up. 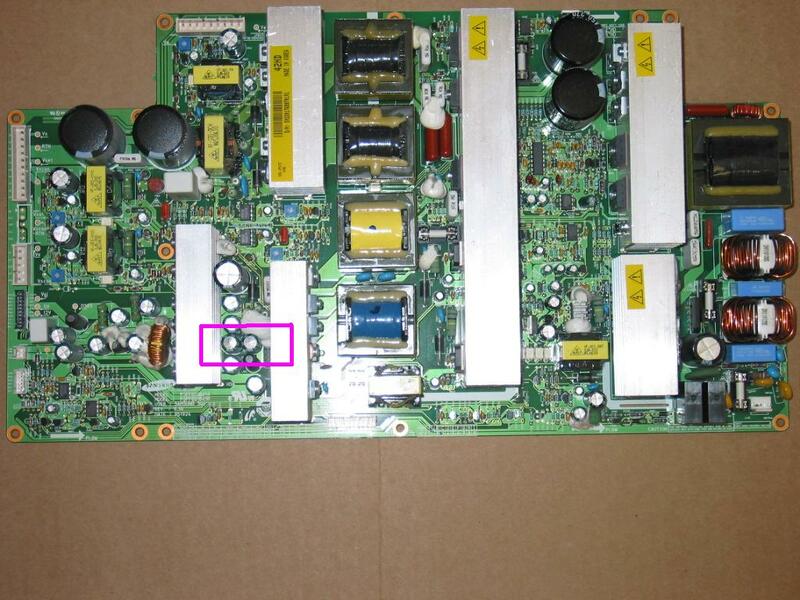 Currently there is a case escalated to eBay to resolve a claim by user aguilar35domingo against CoppellTVRepair because we did not sent them a different board than the one that they sent. It was the dirtiest board I have ever seen and if there is anything that I am sorry for it is that I took the challenge and restored it in the first place. So after restoring it, testing it and sending it back, CoppellTVRepair received positive feedback and then - guess what - an open case. And yesterday another claim was opened by user jgul1717 complaining he hasn't received a board just yet when his own was on its way. Today the board arrived and I may post a picture of it later on, even though I am not sure I'll be able to catch what is needed. 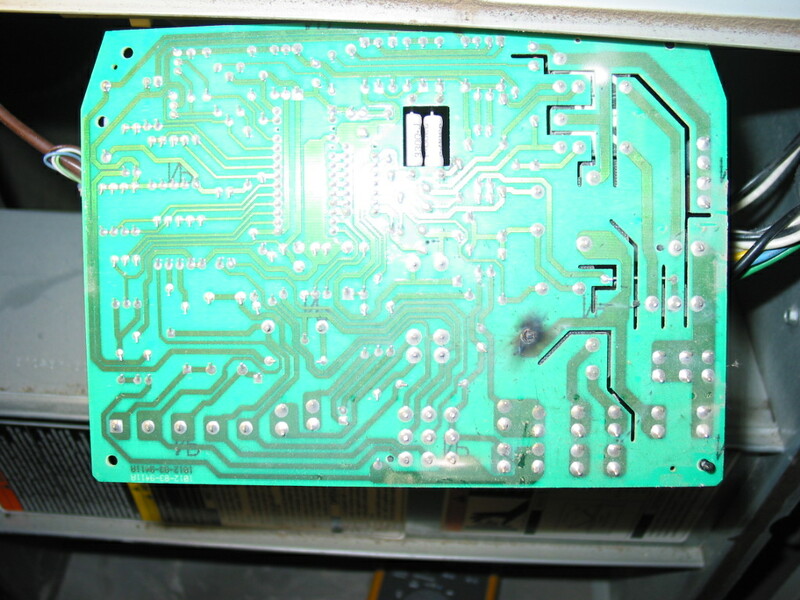 Long story short, someone with a VERY BIG and VERY HOT solder iron has re-soldered most joints under the board, resulting in a complete mess and several burned tracks. Those are two cases which - for the time being - Bay counts against our TopRated rating even though we have made it very clear in the listings (and it is very untuitive) that we are not wiling to exchange good serviced boards for tempered ones. Also this week a customer from Jersey asked that I send him a board in advance. We have spoken on the phone earlier in the week and I stated our policy, but he kept on pressing so I eventually said "OK, send me a tracking number and I'll see what I can do". I know I said that because I was very clearly aware I did not want to make a firm promise that I might not be able to fulfil. Anyway, today customer called and was upset the board wasn't yet sent. Truth is it wasn't because I had to deal with cases practically identical with his one. The difference is in the sender - this NJ cusomer is most likely a decent and honest person, maybe just as you are - but the case under which we operate is practically the same. You see, we can't judge people unless we kno them very well. And, take it from me, even then when money are involved. But that's another story. What I am trying to say is that when there is uncertainty and very objective considerations in place then the best way to go is to stick by the rules that a deal has been signed over. That would result in slower, but more reliable business. We may lose the NJ customer because they may feel we did not make an extra leap for them. Even though I had to - and did - rush today to get the cutoff time for UPS to send their particular board so that it leaves today and not tomorrow. If that's the way then so be it. We'll fulful the deal arrangement at least as good as it was listed and if you are unhappy then please refrain from doing a business with us for the future. If you've already placed an order call us and if possible we will stop it and refund you. To some long-time customers we will make exceptions, of course. And assume the risk. Please do not be offended if you are not considered a long time customer on your second order. It is exceptions we are talking about here, not rules for long-time customers. One popular and simple approach to receiving a board in advance is to pay a purchase (and not service) price for a board, then send the core in and receive credit when it arrives and passes inspection that it hasn't been tempered with. In conclusion...we are here to help you, our customer. And even though it may seem contrary at first, keeping the rules that build the foundation of the business is more important than groing the business. This article applies to a wide number of 50'' plasma TVs utilizing LG plasma panels and sustain boards like 6871QDH088A / 6870QYC004A , 6871QYH039B, 6871QZH044B, 6871QDH089A / 6870QYC104A and the likes. In fact, many of what is said here applies to pretty much all plasma TVs made as of 2011. The principles are the same and you can easily transfer the knowledge applied here to a different model. 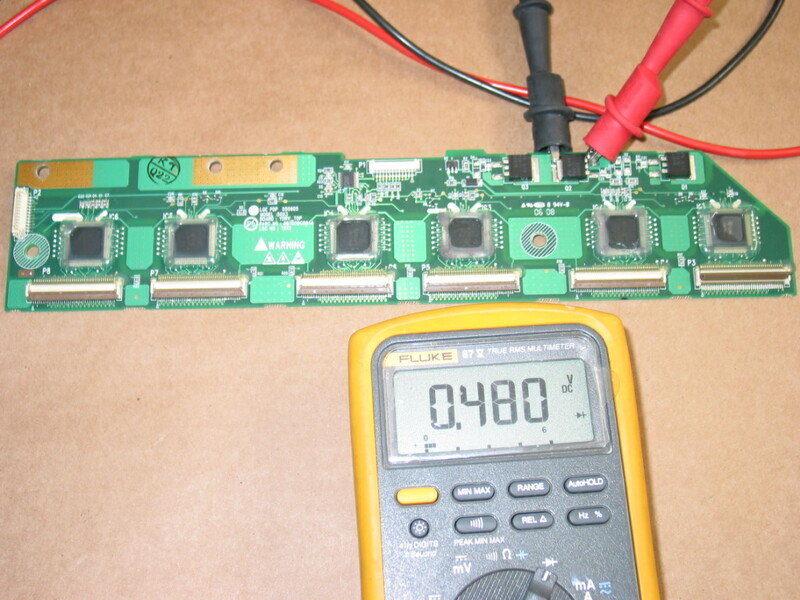 We at Coppell TV Repair service a lot of plasma sustain and buffer boards. In my opinion there is a lot to be said about servicing them properly (as I have mentioned in a previous article), but today I want to focus on the 6870QDC004A and 6870QDC005A and one of the most common issues we see with them and the different TVs in which they are used. Buffer board(s) sit on the left side of the main Y sustain board, which sits on the left side of the TV if you look from the back. In our case there are two buffers, called upper and lower buffer, responsible respectively for setting the line pixels in the upper and lower half of the display. "Your board does not work", they proclaim, "and I want to know what do you intend to do about it!" I wish we could really do something particular about it! If I had the power I'd turn those customers to exclamation marks right on the spot! Long story short, this is a typical result when a buffer board has failed. Once - out of easily hundreds of times - I have seen the same thing caused by a bad YSUS board. It was caused by a filter capacitor at the YSUS output which has decided to short, but not quite completely, so board was running, but severely disturbed. Easily 99% of the time when you have vertical bars on the screen it'll be a buffer board. If there are two it could be either of them. Probably the easiest check you can do on the boards is between the floating ground and the high voltage copper pads that contact with the Y sustain board. A bad board, would typically have resistance in both directions and most of the boards that I have seen measure hundreds of Ohms in one of the directions. That's a clear sign for a bad board. Another quick test that you can run which might want to try is checking the power FETs on the board for shorts. You can measure just one and any one of them because all three are in parallel. What you are looking for is a standard FET test condition - diode-like effect with sufficiently high resistance in either direction. Now pay attention here that sometimes you may get a false positive: depending on the unit you have and its algorithm for detecting shots, many devices (including my Fluke!) are often signaling short when , in fact, there isn't any. It's likely the built-in protection diodes in the transistor that cause the effect, I am not sure about it, but I have more than certainly observed it in different kinds of FETs including those on the buffer boards. The way I eliminate the false positives is as follows: first, try it both directions. If it's really short it can't be uni-directional. Second, after testing in diode mode, switch to ohm-meter and test it there as well. The ohm-metter algorithm is different and usually doesn't trigger. Usually only one of the buffers burns at a time and does not affect other boards in the TV. It's OK to replace or repair only that buffer. As of the date of this writing a replacement used buffer can be found for about $35-$40 delivered to you. Sure time will change that, but not very clear in which direction. Just make sure you buy from someone reliable who will either sell you a buffer they know is good (by reading this) or ready to offer you warranty about it. Note all three FETs are connected in parallel and you can't tell which one is shorted until you actually fetch it and try it individually. I should also mention that the Fluke I use is sometimes tricked by the FETs and led to believe they are short when they aren't. I test in diode mode and am used to checking for continuity in each direction at least two times before taking off a component. Before you buy the kit you may also want to be sure that you do not have a burned IC on the board. Repeat the test described above AFTER you remove the suspected FET. You may even want to remove all 3 FETs (and then replace all three of them) to see if the resistance measured will restore. If it doesn't then you have a burned IC in addition to a burned FET. I would not recommend that for someone who hasn't tried a few times. If you are dying to get into it that's OK, but consider the high probability of having a few failures before you start doing it right. 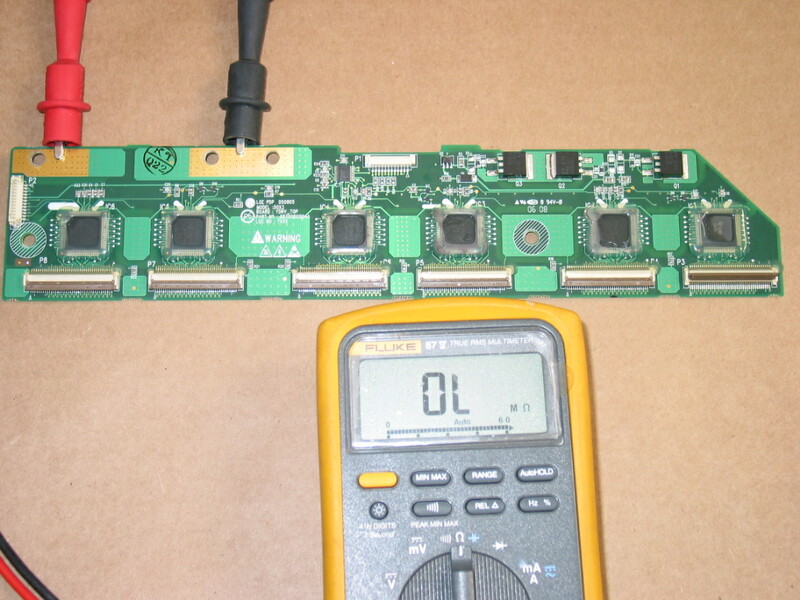 The proper replacement of TQFP-64 and TQFP-100 ICs is beyond the scope of this article. If I haven't been posting lots of TV repair hints lately it's because I've been busy fixing TVs or cars or , as of the last two days, HVACs. OK, down to business. Based on what I found I expect this to be a common problem with Carrier home AC systems and I hope this will help others in my position save time and money. 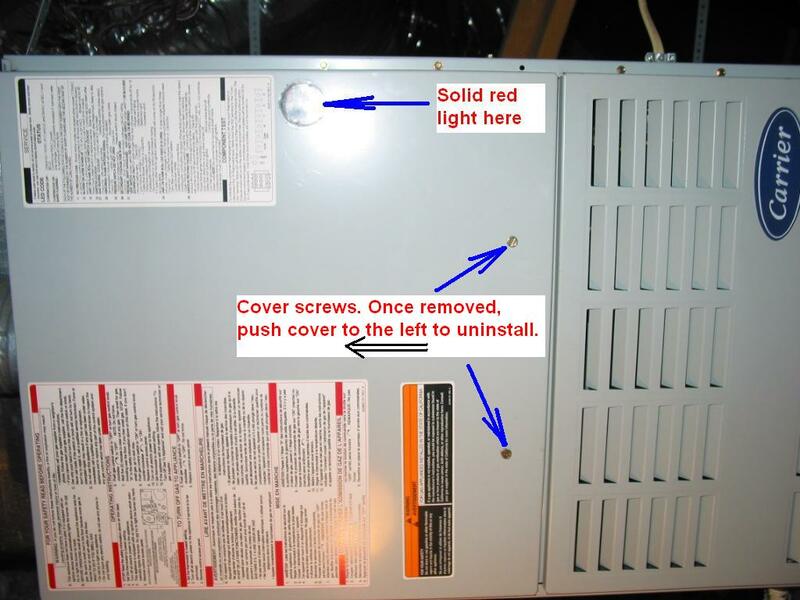 Problem likely affects all Carrier furnace located control boards 325878-751 - models HK42FZ004, HK42FZ007, HK42FZ008, HK42FZ009, HK42FZ011, HK42FZ016. Those are used in HVAC system models 340MAV, 345MAV, 350MAV, 351DA, 373LAV, 376CAV, 383KAV, 393AAV, 395CAV, 480BAV, 481BAV, 490AAV, 58MCA, 58MSA, 58MXA, 58PAV, 58RAV, 58WAV, 58YAV, 58ZAV, GB1AAV, GB3AAV, PG8DAA, PG8UAA and PG9MAA. I'll first give you the very short version and then the longer one with pictorial. Symptom: AC control panel is on, says "COOL ON" but no air blows anywhere in the house. Same with FAN ON. Outside unit (compressor) works when the "COOL ON" is displayed on the control panel (it is normal for it to NOT work otherwise). 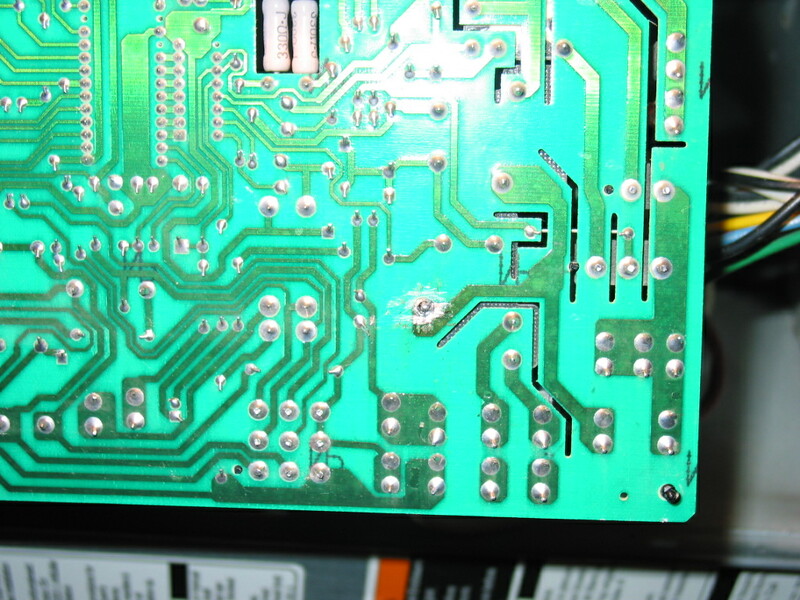 Problem: Burned relay solder contact on control board 325878-751. Resolution: Clean and re-solder the contact, cover with protective coating to prevent from happening again. So the AC turns on (cold in my case) but no air flows anywhere in the house. As with everything I started on Internet and first read this article. You may read it as well, it's a simple and useful introduction. I tried what was suggested there - resetting the system once - before you try other things, because I remember one time in the past when I paid AC technician $100 to do just that - reset the unit. Nor do you want to try to fix something that isn't broken in the first place...so try soft reset first! Notice the LED light was solid red, indicating presence of 24V to the system and no errors. The cover switch at the upper right corner is used to automatically turn off the control board whenever the cover is taken out. 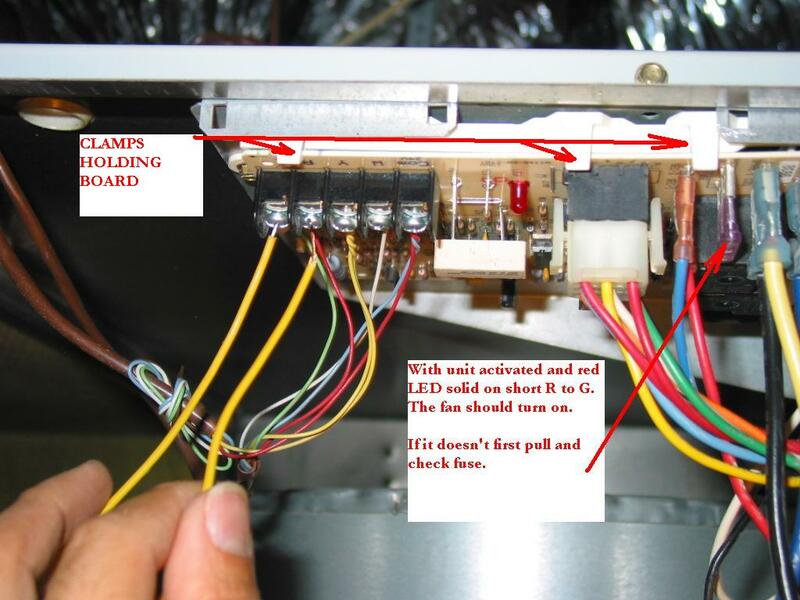 You will need to use a tape to stick it in closed position and run tests, but remember that any later operations on the board better be done with the whole system turned off by this AND the main unit power switch (follow the furnace power cable to the switch). One thing you will want to do is bring light up there in the attic as I did. Helps tremendously and pays the effort of doing it in the first minute you have it! On the left side you have the control/sensor connectors marked G, R, Y and W for the color of the wires that go to them. Last is the COM. 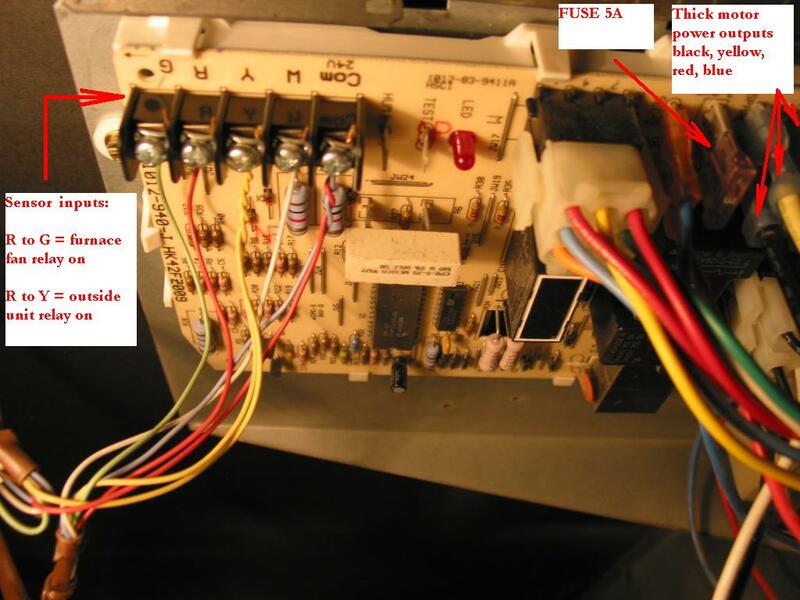 Also on this picture I am showing the board's fuse, which is worth checking before you do anything else. I mean that's what fuses are for, right? Finally, you can look at the thick cables that go from the board to the motor. There are several of them because there are several different windings for different speeds of the motor. Only one of them is being active at a time though and they take simple 110V AC. There's a fifth (white) cable not shown in the picture, which is the common second connector. You should hear a relay click quickly followed by the noise of the motor in the back. In my case, I could hear the click, but the motor never did a spin. Before doing what I describe below I actually took it out and measured it with my FLUKE. It measured what it said on the unit itself - around 10 uF, but bear in mind this is not always reliable, even with a Fluke...not to mention many of you may not have Fluke. At the end of the post I give a few useful links from pros in this business that helped me and may as well help you. I returned the capacitor in place and I was planning on directly passing 110V to the motor to test if it will spin when I decided to first take a look at the board due to something I had read about repeatedly failed solder joint. I have seen the exact same things in other power appliances such as laser printers and some large TVs and I figured it's easier to check this than trying 110V on a motor I have never seen before. So after disconnecting the furnace from the master switch, I released the board clamps (see the above pictures) and gently pulled the board out. There was actually one black clamp different from the others. It was was holding the board stuck to the underlying (or, since it is upside down, above-lying) plastic base. This clamp is located at the front right side of the board and I just gently pried it out with a large screwdriver. May not be the best way to do it, but worked for me and it should for you as long as you do not apply too much power. From here on it was very easy. Just clean with a small screwdriver or a knife, solder (with flux!) 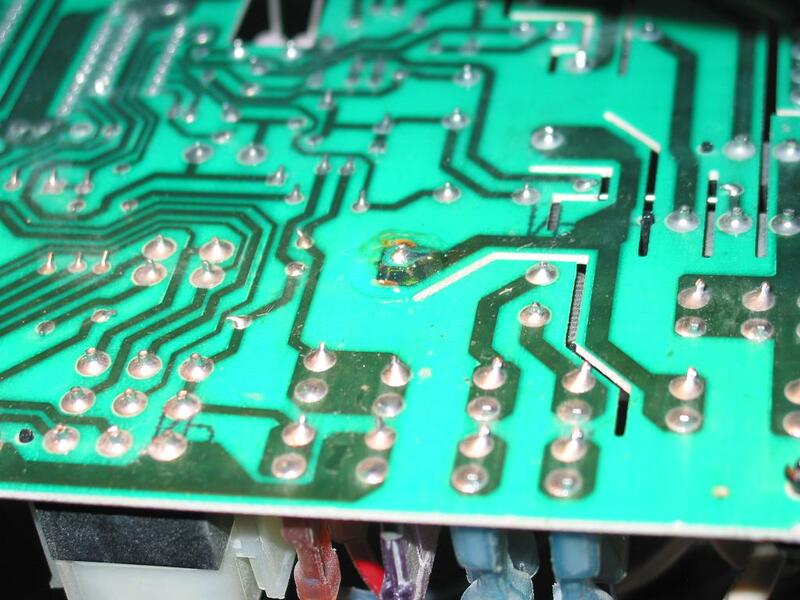 and, in my case, apply acrylic conformal coating on top of the solder to decrease chances from this happening again.